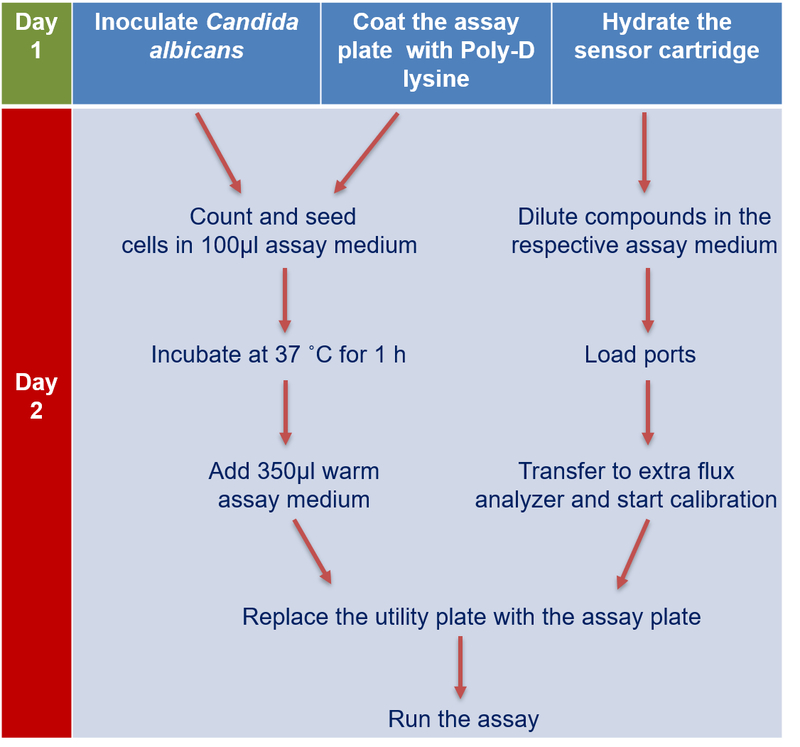 Here, we present a stepwise protocol to investigate the mitochondrial respiration and glycolytic function in Candida Albicans using an extra flux analyzer. Venkatesh, S., Chauhan, M., Suzuki, C., Chauhan, N. Bio-energetics Investigation of Candida albicans Using Real-time Extracellular Flux Analysis. J. Vis. Exp. (145), e58913, doi:10.3791/58913 (2019). Mitochondria are essential organelles for the cellular metabolism and survival. A variety of key events take place in mitochondria, such as cellular respiration, oxidative metabolism, signal transduction, and apoptosis. Consequently, mitochondrial dysfunction is reported to play an important role in the antifungal drug tolerance and virulence of pathogenic fungi. Recent data have also led to the recognition of the importance of the mitochondria as an important contributor to fungal pathogenesis. Despite the importance of the mitochondria in fungal biology, standardized methods to understand its function are poorly developed. Here, we present a procedure to study the basal oxygen consumption rate (OCR), a measure of mitochondrial respiration, and extracellular acidification rates (ECAR), a measure of glycolytic function in C. albicans strains. The method described herein can be applied to any Candidaspp. strains without the need to purify mitochondria from the intact fungal cells. Furthermore, this protocol can also be customized to screen for inhibitors of mitochondrial function in C. albicans strains. Invasive fungal infections kill over 1.5 million people a year worldwide. This number is on the rise due to an increase in the numbers of people living with compromised immunity, including the elderly, premature infants, transplant recipients, and cancer patients1. C. albicans is an opportunistic human fungal pathogen that is a part of the human microflora. It also inhabits mucosal surfaces and the gastrointestinal tract as a commensal organism. C. albicans produces serious systemic disease in people who have immune deficiencies, who have undergone surgery, or who have been treated with long courses of antibiotics. The Candida species rank among the top three to four causes of nosocomial infectious diseases (NID) in humans2,3,4,5,6,7. The annual global number of Candida bloodstream infections is estimated to be ~400,000 cases, with associated mortalities of 46-75%1. The annual mortality because of candidiasis is roughly 10,000 in the United States alone. The extent of NID caused by fungi is also reflected in astronomical patient expenses5. In the United States, the yearly expense for the treatment of invasive fungal infections surpasses $2 billion, adding a huge strain to already overburdened health care system. Currently, available standard antifungal therapies are limited because of toxicity, increasingly prevalent drug resistance, and drug-drug interactions. Therefore, there is an urgent need to identify new antifungal drug targets that will result in better treatment options for high-risk patients. However, the discovery of new drugs acting on fungal targets is complicated because fungi are eukaryotes. This greatly limits the number of fungal-specific drug targets. Recent studies have indicated that mitochondria are a critical contributor to the fungal virulence and tolerance to antifungal drugs since mitochondria are important for cellular respiration, oxidative metabolism, signal transduction, and apoptosis8,9,10,11. Both glycolytic and non-glycolytic metabolism are essential for the survival of C. albicans in the mammalian host12,13,14,15,16. Furthermore, several C. albicans mutants lacking mitochondrial proteins, such as Goa1, Srr1, Gem1, Sam37 etc. have been shown to be defective in filamentation, an important virulence factor of C. albicans17,18,19,20,21,22. In addition, these mutants were also shown to be attenuated for virulence in a mouse model of disseminated candidiasis17,18,19,20,21,22. Thus, fungal mitochondria represent an attractive target for drug discovery. However, the study of mitochondrial function in C. albicans is challenging because C. albicans is petite negative23, which means that it cannot survive without the mitochondrial genome. Here, we describe a protocol that can be used to investigate mitochondrial and glycolytic function in C. albicans without the need to purify mitochondria. This method can also be optimized to investigate the effect of the genetic manipulation or chemical modulators on mitochondrial and glycolytic pathways in C. albicans. NOTE: The detailed stepwise protocol of the assay is described below, and the schematic protocol is shown in Figure 1. Grow the C. albicans strains in liquid Yeast Extract-Peptone-Dextrose (YPD) medium at 30 °C in an incubator shaker overnight. NOTE: Maintain Candida strains as frozen stocks and grow on YPD agar (1 % yeast extract, 2% peptone, 2% dextrose, and 2% agar). For mitochondrial function assay, dissolve 1.04 g Roswell Park Memorial Institute (RPMI) 1640 powder and 2 g glucose (2%) in 90 mL sterile water and warm the media to 37 °C. Adjust the pH to 7.4 using 5 M NaOH and make up the volume to 100 mL with sterile water. For glycolytic stress assay, dissolve 1.04 g RPMI 1640 powder alone in 90 mL sterile water, warm the media to 37 °C and adjust the pH to 7.4. Make up the volume to 100 mL with sterile water. RPMI 1640 powder has no bicarbonate, which is critical to monitor the pH change as a measure of glycolysis during the assay. Prepare 1 M glucose stock in sterile water and store at -20 °C. Prepare 100 mM oligomycin stock in dimethyl sulfoxide (DMSO), aliquot in small volumes and store at -20 °C. Prepare 100 mM antimycin A stock in DMSO, aliquot in small volumes and store at -20 °C. Prepare 100 mM SHAM (salicylhydroxamic acid) stock in ethanol on the day of assay. Prepare 1 M KCN in the sterile water on the day of the assay. NOTE: Perform all the below steps in a laminar hood. Dissolve Poly-D Lysine in tissue culture grade water to make 50 µg/mL final concentration. Mix it well and aliquot into a 1.5 mL microcentrifuge tubes and store at -20 °C for the long term. NOTE: 50 µL per well is needed, and for 24 wells, 1.2 mL is required. Therefore, aliquot at least 1.3 mL per microcentrifuge tube. Add 50 µL per well and incubate at room temperature with the lid covered for 1-2 h.
Aspirate the solution and rinse one time with 500 µL sterile tissue culture grade water. Open the lid and allow the wells to air dry. Use the plate on the same day or store at 4 °C for a maximum of 2-3 days. NOTE: Perform this step one day before the experiment. Open the extra flux Assay Kit and remove the contents. Place the sensor cartridge upside down next to the utility plate (Figure 2). Fill each well of the utility plate with 1 mL of calibrant and place the sensor cartridge back. Make sure the sensors which contain fluorophores (to measure the oxygen and pH) are submerged in the calibrant. Incubate the sensor cartridge overnight in a non-CO2 incubator at 37 °C. Inoculate C. albicans in the YPD broth and grow overnight at 30 °C in a shaker at 200 rpm. NOTE: Based on the assay design and the interest, C. albicans can also be grown in YPG or minimal medium. On the day of assay, dilute an appropriate number of cells in the assay medium to yield a final concentration of 100,000 cells per 100 µL. Add 100 µL of the diluted cells into each well of the assay plate except wells A1, B4, C3, and D6, in which add only 100 µL of the assay medium for background correction (Figure 3). Transfer the plate to a non-CO2 incubator at 37 °C and incubate for 60 min, which will let the cells adhere to the plate surface. NOTE: The protocol outlined here is for the 24-well format of the instrument. Volumes will need to be adjusted if another format is used. Prepare compounds at 10x concentration for mitochondrial function assay: Prepare 20 mM SHAM, 100 µM Oligomycin, 100 mM KCN, and 20 µM Antimycin A in the corresponding assay medium. Add 50 µL SHAM into the port A, 55 µL Oligomycin into port B, 62 µL KCN into port C and 68 µL Antimycin A into port D (Figure 4). Prepare compounds at 10x concentration for glycolytic stress assay. Prepare 100 mM glucose, 100 µM Oligomycin, 500 mM 2-Deoxy Glucose (2DG) and 20 µM Antimycin A in the corresponding assay medium. Add 50 µL glucose into port A, 55 µL Oligomycin into port B, 62 µL 2-DG into port C and 68 µL Antimycin A into port D.
Employ extra flux analyzer, which measures oxygen consumption rate (OCR) and extracellular acidification rate (ECAR) of live cells in a 24-well plate format. Set up the assay protocol in advance. Open the extra flux analyzer and set up the assay template by using the assay wizard tab and follow step by step instruction to fill out all the information that pops out during the setup. Generate the group layout as similar to shown in Figure 5. Set up the protocol as shown in Table 1. 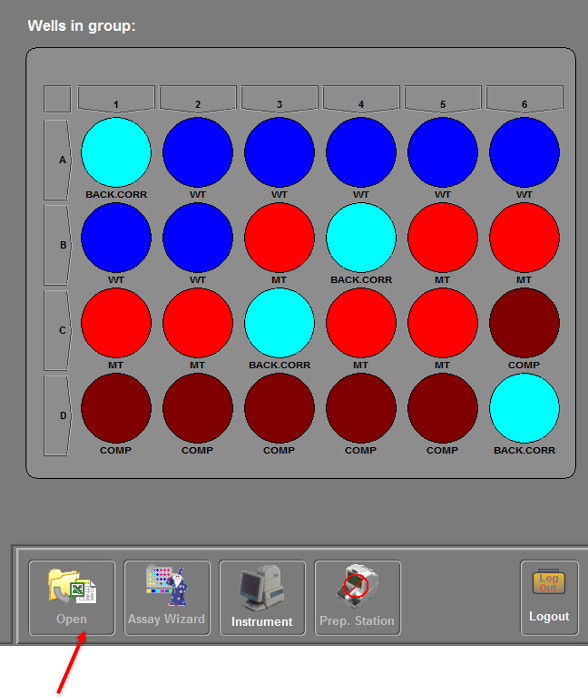 Set up these layouts well ahead before assay and save in the computer. At the time of assay, restore the saved protocol by opening the corresponding file in the open file option in the assay wizard tab (Figure 5). Load the 10x compounds in the respective ports of the hydrated sensor cartridge containing the calibrant and load in the carrier tray of the extra flux analyzer. Start the calibration by pressing the Start button on the screen. 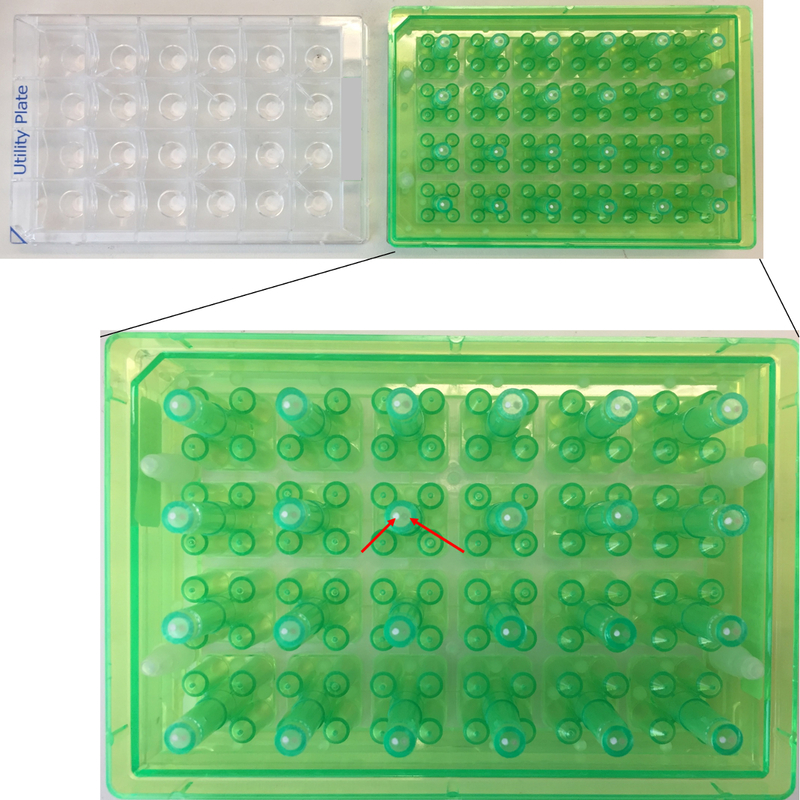 Add 350 µL of the assay medium gently to the cell plate along the side of the wells to minimize cell disturbance to bring the final volume to 450 µL. 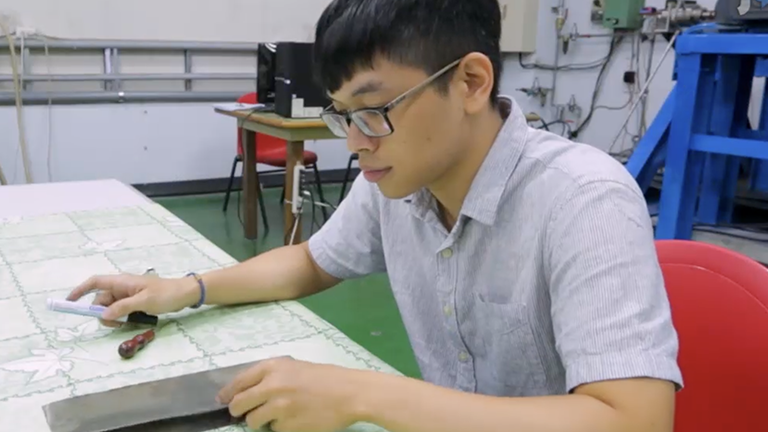 Replace the utility plate containing the calibrant with the assay plate and continue. Remove the sensor cartridge and the plate once the assay is completed. Save the file in the appropriate destination folder. 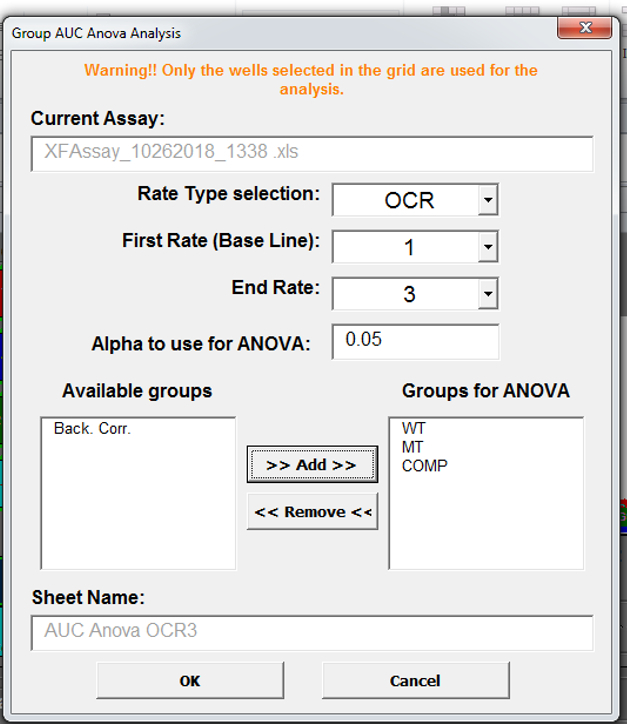 Use the area under the curve- analysis of variance (AUC-ANOVA) analysis tab in the software to calculate the significant difference between the groups by selecting the respective parameters (OCR or ECAR) as shown in Figure 6. Select the groups that need to be compared. 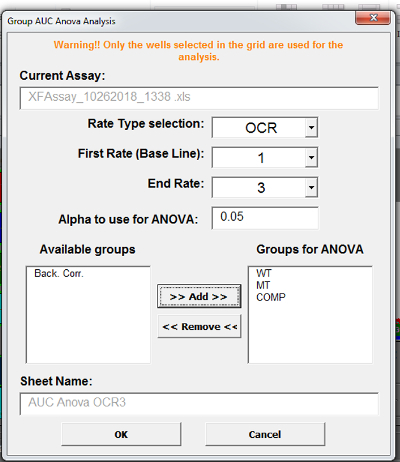 Add to the analysis groups for ANOVA and click Ok. NOTE: This AUC ANOVA analysis will add a new sheet to the file in which the AUC is calculated for each group and compared between them by ANOVA. This will give a table of p values to show the significance. The focus of this protocol is to determine the bioenergetic functions of C. albicans assessed by extra flux analyzer. A C. albicans mutant lacking mitochondrial protein Mam33 is also included along with its complement strain, mam33Δ/Δ::MAM33 to study the effects of the deletion of a mitochondrial protein on OCR and ECAR. MAM33 encodes for a putative mitochondrial acidic matrix protein and its function in Candida is not known. 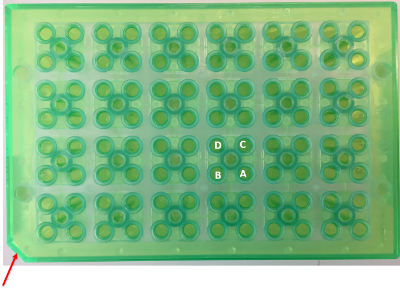 We employed 1x 105 C. albicans wild type cells per well in the extra flux assay, which showed an OCR of 145 pmol/min (Figure 7), which is within the optimal range of 100-300 pmol/min for any extracellular flux assay. 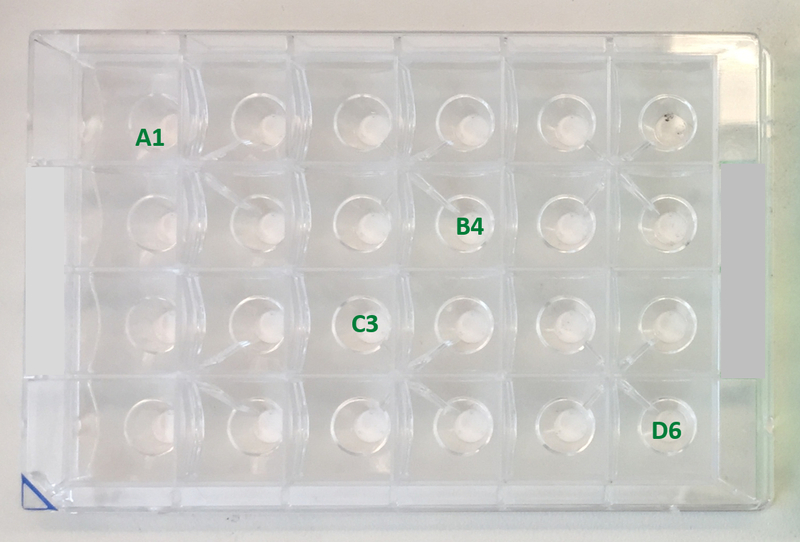 It is also important to titrate the cell number to obtain an optimal OCR before the assay or when there is a change in growth medium composition between different assays. The area under the curve- analysis of variance (AUC-ANOVA) analysis tab in the software was used to calculate the significant difference between the groups by selecting the respective parameters (OCR or ECAR) as shown in Figure 7. This analysis added a new sheet to the file in which the AUC was calculated for each group and compared between them by ANOVA automatically, which gave a table of p values. In the mitochondrial stress test, the assay starts with measuring the basal oxygen consumption rate (OCR) followed by injection of inhibitors of an alternate oxidase (AOX), ATP synthase, and electron transport chain complexes, IV and III. In addition to the classical respiratory chain, C. albicans also utilizes the AOX pathway for energy generation24. Therefore, we investigated the effect of AOX system on OCR by inhibiting its activity by using salicylhydroxamic acid (SHAM)25. The mitochondrial function, which was measured as an oxygen consumption rate (OCR) in pmol/min at basal and after injecting respective inhibitors is shown in Figure 7. The basal OCR of wild type, mam33Δ/Δ, and mam33Δ/Δ::MAM33 strains showed no differences (Figure 7A and B). Similarly, no significant difference in the basal ECAR was observed between these strains (Figure 7C and D). 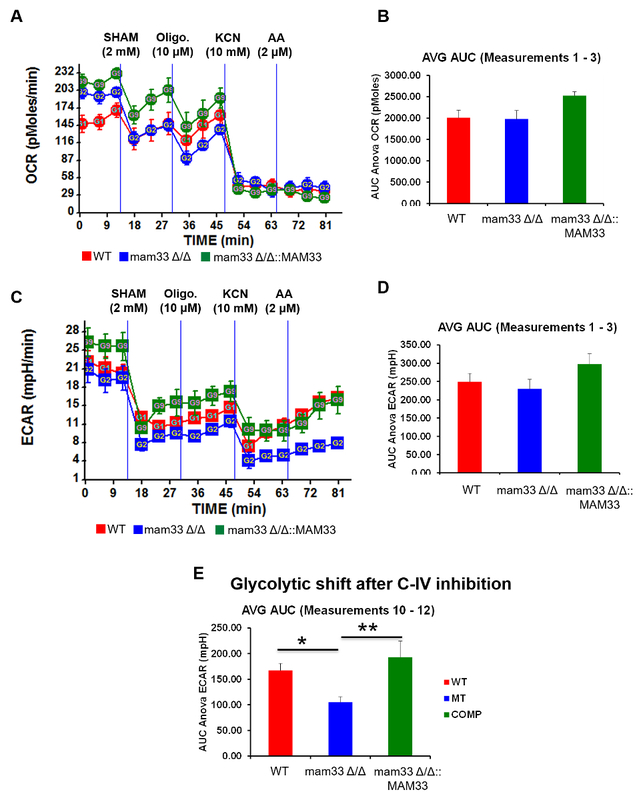 However, by inhibiting complex IV by KCN, wild type and mam33Δ/Δ::MAM33 showed a substantial shift toward the glycolysis in contrast to mam33Δ/Δ, which significantly failed to show a compensatory glycolytic shift (Figure 7E), suggesting that C-IV dependent glycolytic pathway is impaired in the mam33Δ/Δ mutant compared to wild type and mam33Δ/Δ::MAM33 strains. In the glycolytic stress test, cells were starved for glucose for 1 h and the basal OCR and ECAR was measured. Upon starvation, mam33Δ/Δ showed significantly lower OCR (Figure 8A and B) and ECAR (Figure 8C and D) compared to the wild type and mam33Δ/Δ::MAM33 strains suggesting an impaired utilization of glucose for both respiration and glycolysis when cells are forced to the starvation condition. After injecting glucose, all strains showed stimulation of both OCR and ECAR. Although oligomycin has less effect on both OCR and ECAR, 2-DG, which is a competitive inhibitor of glycolysis, inhibits both OCR and ECAR. Specifically, 2-DG partially inhibits OCR, which is further inhibited by Antimycin A. In contrast, 2-DG almost completely inhibits ECAR. Figure 1. Schematic representation of the experiment Please click here to view a larger version of this figure. Figure 2. Sensor cartridge (green) placed upside down near the utility plate before adding the calibrant. Fluorophores are indicated by arrows. Please click here to view a larger version of this figure. Figure 3. Cell culture plate showing background wells A1, B4, C3, and D6. The blue mark shows the notch, oriented to the lower left. Please click here to view a larger version of this figure. Figure 4. The top portion of the sensor cartridge showing ports A, B, C and D. The arrow mark shows the notch, oriented to the lower left. Please click here to view a larger version of this figure. Figure 5. The layout of wells and group assignment as visualized in the software. WT- wild type; MT- mam33Δ/Δ mutant; COMP- mam33Δ/Δ::MAM33 complement strain. Arrow mark shows the open file tab. Please click here to view a larger version of this figure. Figure 6. The area under the curve (AUC) ANOVA analysis tab to calculate the significance between the groups. Select the groups that need to be compared and add to the analysis groups for ANOVA and click ok. This AUC ANOVA analysis will add a new sheet to the file in which the AUC is calculated for each group and compared between them by ANOVA. This will give a table of p values to show the significance. Please click here to view a larger version of this figure. Figure 7. Mitochondrial function assay in C. albicans. Oxygen consumption and extracellular acidification rates were measured in wild type, mam33 Δ/Δ, and mam33 Δ/Δ::MAM33 strains of C. albicans. A) A real-time graph of oxygen consumption rate (OCR) at basal respiration followed by sequential injection of SHAM (2 mM), Oligomycin (10 µM), KCN (10 mM), and Antimycin A (2 µM). B) Comparison of area under the curve (AUC) basal OCR between wild type, mam33Δ/Δ, and mam33Δ/Δ::MAM33 strains of C. albicans show no significant difference. C) A real-time graph of extracellular acidification rate (ECAR) at basal glycolysis followed by sequential injection of SHAM (2 mM), Oligomycin (10 µM), KCN (10 mM), and Antimycin A (2 µM). D) Comparison of area under the curve (AUC) basal ECAR between wild type, mam33Δ/Δ, and mam33Δ/Δ::MAM33 strains of C. albicans show no significant difference. E) Comparison of area under curve (AUC) ECAR between wild type, mam33Δ/Δ and mam33 Δ/Δ::MAM33 strains of C. albicans after the injection of C-IV inhibitor KCN show significant decrease in glycolytic shift in mam33Δ/Δ mutant compared to wild type and complementary strains Values are expressed as average ± standard error mean. * p<0.05, ** p<0.001 is considered as significant by one-way ANOVA. Please click here to view a larger version of this figure. Figure 8. Glycolytic stress assay in C. albicans. Oxygen consumption and extracellular acidification were measured in wild type, mam33Δ/Δ mutant after they were starved for glucose followed by acute injection of saturated glucose concentration. A) A real-time graph of oxygen consumption rate after cells were subjected to basal ECAR followed by sequential injection of glucose (10 mM), Oligomycin (1 µM), 2-DG (40 mM), and Antimycin A (2 µM). B) Bar graph showing the area under the curve ECAR of basal glycolysis between wild type, mam33Δ/Δ, and mam33Δ/Δ::MAM33 strains of C. albicans. C) A real-time graph of the glycolytic function after cells were subjected to basal ECAR followed by sequential injection of glucose (10 mM), Oligomycin (1 µM), 2-DG (40mM), and Antimycin A (2 µM). D) Bar graph showing the area under the curve ECAR of basal glycolysis between wild type, mam33Δ/Δ, and mam33Δ/Δ::MAM33 strains of C. albicans Values are expressed as average ± standard error mean. * p<0.05, *** p<0.0005, **** p<0.0001 is considered as significant by one-way ANOVA. Please click here to view a larger version of this figure. The bioenergetics extra flux assay serves as an excellent tool to read out the mitochondrial function by measuring oxidative phosphorylation (OXPHOS)-dependent oxygen consumption in real-time. In addition, a glycolytic function which is measured as an extracellular acidification rate (change in extracellular pH) can also be investigated at the same time in real-time analysis. Successful plating of C. albicans in the assay plate is one of the critical steps in the assay because the incubation of the cells in the PDL coated plates allow the cells to adhere to the assay plate. Visualization of adhering C. albicans cells is accomplished by light microscopy. Improper cell adherence may lead to cells floating in the wells, which will affect the assay outcome with inconsistent readings between replicates. Similarly, it is important to perform the cell number titration as the first step in this assay to obtain an OCR between 100-300 pmol/min, which is an optimal range. Also, titrating the compounds to obtain the optimal concentration is also critical to achieving the optimal response. This may be performed whenever there is a change in the basal medium composition. DMEM is the most commonly used basal medium in the extra flux assay for mammalian cells. However, in our hands, RPMI 1640 medium gave the optimal results with C. albicans. This was primarily due to the efficacy of mitochondrial electron transport chain complex inhibitors that worked better in RPMI 1640 medium compared to DMEM. In this assay, wild type, mam33Δ/Δ, and mam33Δ/Δ::MAM33 strains of C. albicans were used to assess the mitochondrial respiration and glycolytic efficiency. 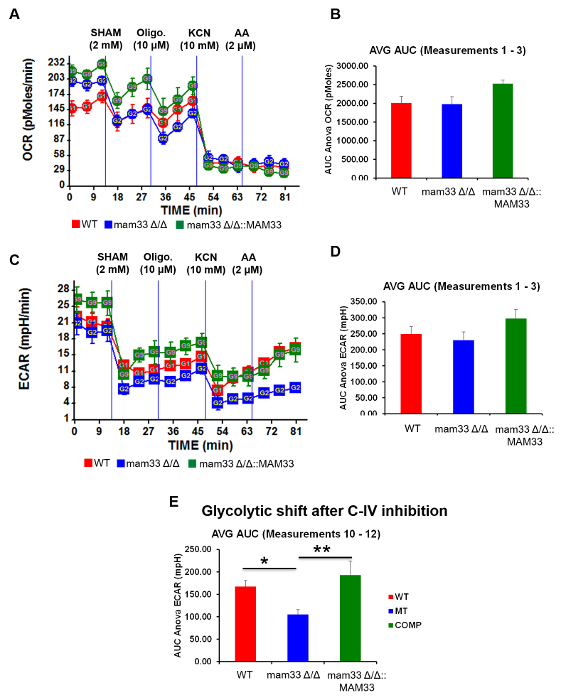 The results clearly show that the deletion of MAM33 gene reduced the ability of the C. albicans to shift to glycolysis under stress conditions such as inhibition of C-IV (Figure 7C and 7E). 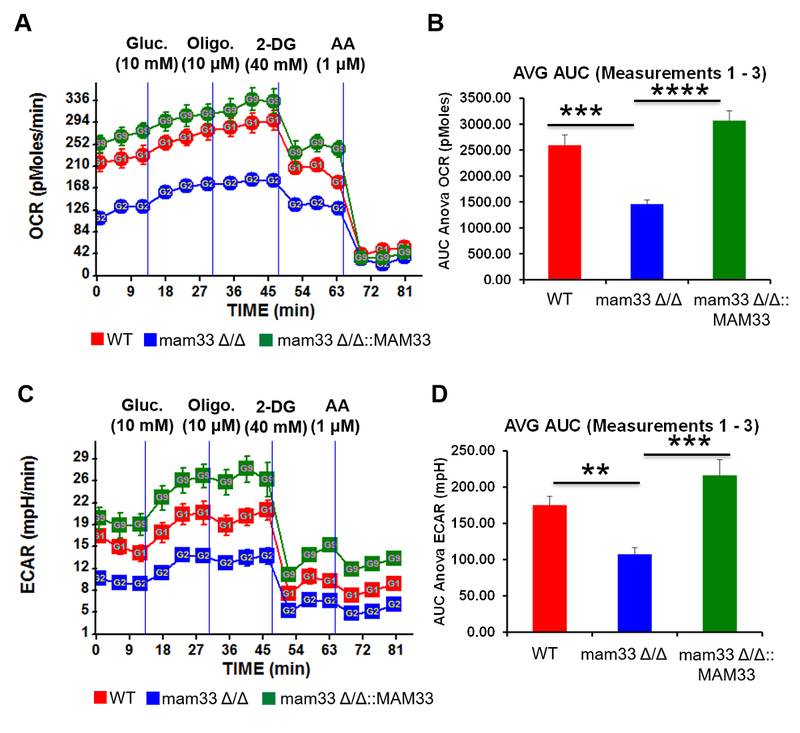 Similarly, when cells were subjected to stress condition like glucose starvation, both mitochondrial respiration and glycolytic efficiency is significantly compromised in the mam33Δ/Δ mutant but not in the wild type and complement strains (Figure 8). Therefore, depending on experiments, carbon sources in the RPMI 1640 may also be modified to glycerol or galactose, which forces the cells to use OXPHOS rather than glycolysis. The significance of using the extra flux assay is that by using various substrates and compounds that perturb mitochondrial function, the cells ability to utilize OXPHOS versus glycolysis can be inferred. This may be used as an informative tool to understand the effect of any treatments or gene on the mitochondrial function and glycolysis in Candida albicans without isolating mitochondria. The assay measures basal oxygen consumption rate (OCR), which is a measure of mitochondrial respiration, and extracellular acidification rate (ECAR), which is a measure of glycolytic function in both the presence of glucose and after glucose starvation. The extra flux cellular assay is well employed in a variety of mammalian models26. Despite the medical importance of C. albicans, research into fungal mitochondria has been somewhat hampered due to the lack of standardized experimental procedures to study mitochondrial function and glycolysis in real time. This method provides an easy and convenient way of investigating the mitochondrial respiration and glycolytic efficiency by using real-time extracellular flux assay in C. albicans. In future, this assay may also be applied to study the drug-efficacy testing using commonly employed antifungals such as fluconazole. Additionally, another potential future application of this method is in drug discovery, especially for screening compounds targeting mitochondrial function of C. albicans. Research in NC lab is supported by a National Institutes of Health (NIH) grant R01AI24499 and a New Jersey Health Foundation (NJHF) grant, #PC40-18. Brown, G. D., et al. Hidden killers: human fungal infections. Science Translational Medicine. 4, (165), (2012). Wisplinghoff, H., et al. Nosocomial bloodstream infections in US hospitals: analysis of 24,179 cases from a prospective nationwide surveillance study. Clinical Infectious Diseases. 39, (3), 309-317 (2004). Ascioglu, S., et al. Defining opportunistic invasive fungal infections in immunocompromised patients with cancer and hematopoietic stem cell transplants: an international consensus. Clinical Infectious Diseases. 34, (1), 7-14 (2002). Stover, B. H., et al. Nosocomial infection rates in US children's hospitals' neonatal and pediatric intensive care units. American Journal of Infection Control. 29, (3), 152-157 (2001). Wilson, L. S., et al. The direct cost and incidence of systemic fungal infections. Value in Health. 5, (1), 26-34 (2002). Wenzel, R. P. Nosocomial candidemia: risk factors and attributable mortality. Clinical Infectious Diseases. 20, (6), 1531-1534 (1995). Wisplinghoff, H., et al. Nosocomial bloodstream infections in pediatric patients in United States hospitals: epidemiology, clinical features and susceptibilities. Pediatric Infectious Disease Journal. 22, (8), 686-691 (2003). Cheng, W. C., Leach, K. M., Hardwick, J. M. Mitochondrial death pathways in yeast and mammalian cells. Biochimica et Biophysica Acta. 1783, (7), 1272-1279 (2008). Shingu-Vazquez, M., Traven, A. Mitochondria and fungal pathogenesis: drug tolerance, virulence, and potential for antifungal therapy. Eukaryotic Cell. 10, (11), 1376-1383 (2011). Brown, A. J., Brown, G. D., Netea, M. G., Gow, N. A. Metabolism impacts upon Candida immunogenicity and pathogenicity at multiple levels. Trends in Microbiology. 22, (11), 614-622 (2014). Tucey, T. M., et al. Glucose Homeostasis Is Important for Immune Cell Viability during Candida Challenge and Host Survival of Systemic Fungal Infection. Cell Metabolism. 27, (5), 988-1006 (2018). Barelle, C. J., et al. Niche-specific regulation of central metabolic pathways in a fungal pathogen. Cellular Microbiology. 8, (6), 961-971 (2006). Carman, A. J., Vylkova, S., Lorenz, M. C. Role of acetyl coenzyme A synthesis and breakdown in alternative carbon source utilization in Candida albicans. Eukaryotic Cell. 7, (10), 1733-1741 (2008). Fradin, C., et al. Granulocytes govern the transcriptional response, morphology and proliferation of Candida albicans in human blood. Molecular Microbiology. 56, (2), 397-415 (2005). Lorenz, M. C., Bender, J. A., Fink, G. R. Transcriptional response of Candida albicans upon internalization by macrophages. Eukaryotic Cell. 3, (5), 1076-1087 (2004). Ramirez, M. A., Lorenz, M. C. Mutations in alternative carbon utilization pathways in Candida albicans attenuate virulence and confer pleiotropic phenotypes. Eukaryotic Cell. 6, (2), 280-290 (2007). Bambach, A., et al. Goa1p of Candida albicans localizes to the mitochondria during stress and is required for mitochondrial function and virulence. Eukaryotic Cell. 8, (11), 1706-1720 (2009). Li, D., et al. Enzymatic dysfunction of mitochondrial complex I of the Candida albicans goa1 mutant is associated with increased reactive oxidants and cell death. Eukaryotic Cell. 10, (5), 672-682 (2011). Desai, C., Mavrianos, J., Chauhan, N. Candida albicans SRR1, a putative two-component response regulator gene, is required for stress adaptation, morphogenesis, and virulence. Eukaryotic Cell. 10, (10), 1370-1374 (2011). Mavrianos, J., et al. Mitochondrial two-component signaling systems in Candida albicans. Eukaryotic Cell. 12, (6), 913-922 (2013). Koch, B., et al. The Mitochondrial GTPase Gem1 Contributes to the Cell Wall Stress Response and Invasive Growth of Candida albicans. Frontiers in Microbiology. 8, 2555 (2017). Qu, Y., et al. Mitochondrial sorting and assembly machinery subunit Sam37 in Candida albicans: insight into the roles of mitochondria in fitness, cell wall integrity, and virulence. Eukaryotic Cell. 11, (4), 532-544 (2012). Brandt, M. E. Candida and Candidiasis. American Society for Microbiology Press. book review (2002). Huh, W. K., Kang, S. O. Molecular cloning and functional expression of alternative oxidase from Candida albicans. Journal of Bacteriology. 181, (13), 4098-4102 (1999). Yan, L., et al. The alternative oxidase of Candida albicans causes reduced fluconazole susceptibility. Journal of Antimicrobial Chemotherapy. 64, (4), 764-773 (2009). de Moura, M. B., Van Houten, B. Bioenergetic analysis of intact mammalian cells using the Seahorse XF24 Extracellular Flux analyzer and a luciferase ATP assay. Methods in Molecular Biology. 1105, 589-602 (2014).